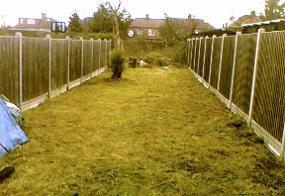 Do you need your garden cleared or tidied and improved? Our gardeners will clear even the most overgrown and neglected gardens and transform them into areas that can once again be used and enjoyed. If you have a garden that is overgrown and needs clearing, don't worry, it's never too late to recover your outdoor space, so contact us now. 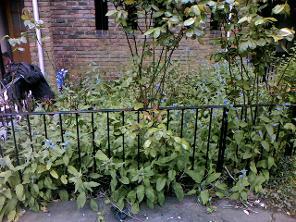 We also work with property developers who need to turn around long since neglected garden areas. Once cleared we can transform the garden space. The photos below show how our gardener cleared and improved a overgrown, weed covered, front garden in Camden, North London, and returned it to a welcoming clean garden with woodchips, feature plants and grasses. The images below are before our gardening work, a front garden split into two sections both over grown, full of weeds and unwanted shrubs. 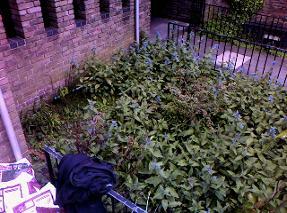 The images below are the same garden after our gardening clearance. We created a front of house display that is welcoming to come home to. The photos below show how our gardener transformed an overgrown jungle outdoor space in Highbury, North London, and returned it to a wonderfully clear, pleasant and usable garden again. 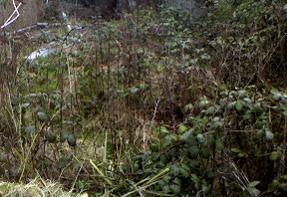 Below shows the garden before our clearance work. It was full from front to back with weeds, thorns and high grass. 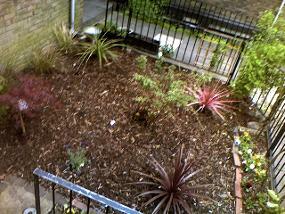 Below shows the same garden after our clearance. 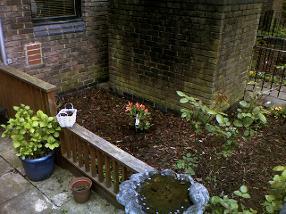 Our gardener provided a clean, clear, safe space for the kids creating a usable family garden.